In 1904 Louis Cartier made a wristwatch for the aviation pioneer Alberto Santos-Dumont. Santos-Dumont had won the Deutsch prize for flying his airship from the Park Saint Cloud to the Eiffel Tower and back in under 30 minutes. He celebrated his success at Maxim's, where he complained to Cartier about the difficulty of checking his pocket watch while flying. 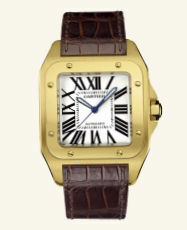 Cartier went to work and produced a watch to be worn on the wrist with a leather strap and a small buckle. Santos-Dumont never again took off without this wristwatch, and Cartier started selling Santos-Dumont wristwatches to the public in 1911, and is still selling them today, which is some achievement.